Not sure where to put this thread. I plunked it here because it has more to do with the VLO design and construction of the F-35, and also to the F-22 for that matter, than vs XYZ (other aircraft) or tactics. Question: To what extent can massive computational number crunching be applied to VHF / UHF radars to develop weapons quality tracks of the F-35 or other VLO aircraft? Submitted for consideration: comments & reporting regarding the Lockheed Martin APY-9 radar on the NG E-4D Advanced Hawkeye. While I tend to take anything Majumbles says with a huge grain of salt, this story and others I have found suggests that sophisticated filters and time-motion analysis of UHF radar returns may enable the E-4D's APY-9 radar to detect and track Chinese and Russian VLO tactical aircraft, and by extension, possibly F-35 and F-22 as well. Of course, even if true, this simply means that all other 4th gen and earlier aircraft will be all that more naked in the electromagnetic spectrum as well. The Northrop Grumman E-2D Advanced Hawkeye maybe the U.S. Navy’s secret weapon against the emerging threat of enemy fifth-generation stealth fighters and cruise missiles. The key to that capability is the aircraft’s powerful UHF-band hybrid mechanical/electronically-scanned AN/APY-9 radar built by Lockheed Martin. Both friend and foe alike have touted UHF radars as an effective countermeasure to stealth technology. One example of that is a paper prepared by Arend Westra that appeared in the National Defense University’s Joint Forces Quarterly academic journal in the 4th quarter issue of 2009. “It is the physics of longer wavelength and resonance that enables VHF and UHF radar to detect stealth aircraft,” Westra wrote in his article titled Radar vs. Stealth. UHF-band radars operate at frequencies between 300MHz and 1GHz, which results in wavelengths that are between 10 centimeters and one meter long. Typically, due to the physical characteristics of fighter-sized stealth aircraft, they must be optimized to defeat higher frequencies in the Ka, Ku, X, C and parts of the S-bands. There is a resonance effect that occurs when a feature on an aircraft—such as a tail-fin tip— is less than eight times the size of a particular frequency wavelength. That omni-directional resonance effect produces a “step change” in an aircraft’s radar cross-section. Effectively what that means is that small stealth aircraft that do not have the size or weight allowances for two feet or more of radar absorbent material coatings on every surface are forced to make trades as to which frequency bands they are optimized for. That would include aircraft like the Chengdu J-20, Shenyang J-31, Sukhoi PAK-FA and indeed the United States’ own Lockheed Martin F-22 Raptor and tri-service F-35 Joint Strike Fighter. Only very large stealth aircraft without protruding empennage surfaces — like the Northrop Grumman B-2 Spirit or the forthcoming Long Range Strike-Bomber — can meet the requirement for geometrical optics regime scattering. “You can’t be everywhere at once on a fighter-sized aircraft,” one source told USNI News earlier in the year. However, as Westra and many other sources point out, UHF and VHF-band radars have historically had some major drawbacks. “Poor resolution in angle and range, however, has historically prevented these radars from providing accurate targeting and fire control,” Westra wrote. Northrop Grumman and Lockheed Martin appear to have overcome the traditional limitations of UHF-band radars in the APY-9 by applying a combination of advanced electronic scanning capability together with enormous digital computing power in the form of space/time adaptive processing. The Navy would not directly address the issue, but service officials did say the APY-9 provides a massive increase in performance over the E-2C Hawkeye 2000’s radar. “The E-2D APY-9 radar provides a significantly enhanced airborne early warning and situational awareness capability against all air targets including threat aircraft and cruise missiles,” said Naval Air Systems Command spokesman Rob Koon in an emailed statement to USNI News. The article by Westra is attached to this post as a PDF. I know we have discussed the fact that VHF can detect stealth aircraft, but the consensus has been they cannot develop a weapons quality target track. This "space/time adaptive processing" mentioned suggests that Lockheed Martin (unclear of Northrop Grumman's role) has developed algorithms that, when applied to the data from the AESA radar, can develop these tracks. Perhaps nothing prevents it, but by further moving the battlespace into the software realm, it opens up more opportunities to outmaneuver and defeat the opponent. Speculating with another guy half a year ago, I suggested that true 6th generation would not be so much about Manned Unmanned Teaming as the Europeans seem to think (as that is still in the 'networking' mindset, I see that as simply an elaboration upon 5th generation), but rather as the full migration of aerial attack into the cyber battlespace (5th generation gets everyone to adopt the network, so now let's talk about exploiting and abusing it). The 6th generation platform would be a high mobile, highly survivable hacking cubicle where the aerial nature of the platform allows [relative] physical access and the hardware and software toolkit to tickle adversary electronics into hindering their efforts. Why would anyone who actually knows something about this kind of thing, talk about it in the public domain? RAM still works to some extent against longer wave radar but not as effectively. Also the long term travel of Stealth aircraft is towards tailless aircraft which are less detectable by VHF. Finally even in the best case the best VHF radar get a target track they are still not going to see the F-22/F-35 frontal RCS any larger than about 0.01 sq m X-band equivalent which is still good enough for a standoff weapon from the F-22/F-35 like an SDB to take out the VHF radar from about 50nm in relative safety. If it is detected if can then jam to reduce the detection/tracking range. Radar Vs Stealth features is a constant changing battle of improvements on both sides but the F-22/F-35 are good for at least the first half of this century and then PCA and later designs can take over. Stealth aircraft are not suddenly going to become non-stealthy and this is more of a threat to J-20 and Su-57 with their best case frontal RCS of 0.05 and 0.1 sq m in the X-band which will be more like 0.5 and 1 sq m X-band equivalent in VHF. They will be very vulnerable to the E-4 sending tracks to fighters nearby. Last edited by marsavian on 16 Nov 2018, 19:47, edited 4 times in total. Many fail to take tactics into account (cough - APA, Winslow, etc - cough). If a system threatens the actions that the attacker wants to do, they will adapt to either go around it or use a multi-prong force (CMs, VLO munitions, SDB, JDAM, MALD-J, etc) to take it out before it can significantly interfere with the operation. There are many other facets to the question than simply "hard to target" resolution. One example is the size of the E2D radar. VHF/UHF radars are large because of the physics. Power and range of detection of these systems are also a consideration, etc etc. The target's RWR systems can more easily detect them as opposed to LPI X-Band, even with modern frequency agile radars. This is why we hear such things as targeting EW-ARF support aircraft instead of the fighter bombers themselves. Ground Systems are equally large/clumsy "targets of opportunity." The US Navy has to have numerous integrated systems of systems to protect the E2. You will not soon see an APY-9 hanging off of an F-18 Superhornet (or SU-35 et al), so an SU-57 (or F-35) is not likely to have such power/computers/radars packed in their fighter sized nose. Ground based setups have a similar issue. That "mobile truck" is not very mobile and makes a very juicy DEAD target. So "even if" the even if doesn't last much past the first hour, without considerable support assets, all of which become weak link targets in a kill chain. That's just one element of the overall kill chain. In the end. We will not know in the unclassified world, and EW in general is a black art of much complexity. But the VLO stealth of F-22/35 aircraft will continue to have range/detection/jamming margins even in more hostile circumstances. The part that caught my eye was the application of space/time adaptive computing algorithms to UHF returns to fish out where the targets are. If it works as advertised for the APY-9, then it is only a matter of time before the other side figures it out. I do not think it negates VLO designs, rather it is simply a response in the neverending game of weapon -- counterweapon, tactic -- countertactic. The countertactic to a counterstealth radar counter to VLO aircraft design may very well be rooted in the ISR / SA aspect of the F-35 design that BlindPilot touched on in a different thread today... and that would be the development of hypersonic weapons deployable from the F-35 (or maybe the B-21?). If you find it, then you can fix it, then you can kill it. The F-35 finds and fixes the target with its sensors, then either kills it with a hypersonic AGM (yet to be developed), or hands it off to another vehicle in a hunter-killer pack (B-21?) which deploys the hypersonic AGM. Why hypersonic? Because from 50-100nm, it has the potential to reduce the reaction time of the enema from minutes to tens of seconds. This would further force the enema to continue to expend dollars (or rubles or yuan) on defensive systems, which stealth has done. So if the question is re-phrased, "Why can't the S300, S400, Sx00 systems apply similar algorithms to UHF and/or VHF radars to find VLO objects?" The answer appears to be, "They can, but..."
blindpilot wrote: You will not soon see an APY-9 hanging off of an F-18 Superhornet (or SU-35 et al), so an SU-57 (or F-35) is not likely to have such power/computers/radars packed in their fighter sized nose. Ground based setups have a similar issue. That "mobile truck" is not very mobile and makes a very juicy DEAD target. So "even if" the even if doesn't last much past the first hour, without considerable support assets, all of which become weak link targets in a kill chain. Here is a followup question: Is it theoretically possible to construct a larger UHF / VHF radar from disparately / separate, much smaller emitters and receivers? For example, astrophysicists do something very similar by constructing radio telescope arrays from individual radio telescopes (https://en.wikipedia.org/wiki/Very_Large_Array). Could not such a large UHF or VHF radar be constructed from separate fighter-sized radars, using a network topology similar to MADL to share necessary data between compute nodes? I am guessing we have the compute power available on the ground now, and may have in the F-35 with the Block 4 processor upgrades, but it is possible the data sharing which could be done via fiber optic on the ground, may exceed MADL's capabilities. That is to say... the amount of data that has to be shared to compute a solution may physically not be possible based on the physics required to share such data via radio-waves. If so... a fourship of Stubbies, or maybe an eightship etc... might have the ability to detect VLO vehicles by working cooperatively. Or does the physics of VHF / UHF wavelengths preclude a transceiver physically fitting into a vehicle as small as a tactical fighter? In order for a phased radar array to work, the elements have to be spaced at a certain distance in order for the beam to be focused & steered. Longer wavelengths (UHF) require the elements to be spaced further apart and conversely short wavelengths (x-band) require tighter packing. I think another factor going against VHF UHF is the bandwidth of the signal. Fundamentally, the more complex (information dense) a signal is (or can be), the more difficult the signal will be to detect, decode, and jam (and that's just a straightforward fact based on physics). The information carrying capacity of a radio frequency band is inversely proportional to the wavelength. While UHF VHF bands might be less vulnerable to stealth shaping, their signals are fundamentally simpler, and therefore easier to detect and jam. This means there are probably good ways of defeating them with active techniques whereas the passive techniques can defeat xband. There's no free lunch here. VHF and UHF do not do so well in the face of Moore's Law and are not magic bullets. Stealth vs stealth fights are going to be network on network, multi band Multi spectral, all assets contributing, distributed sensor type fights. If thats not your game plan or you don't have at least some stealth platforms on your side you will probably just lose. "In modern digital radar receivers, real-time signal processing at 500 MSa/s sampling rate is not a problem, thus real-time target detection can be realized by the proposed radar. When detecting a long range target, to ensure the de-chirped signal has a frequency within the real-time processing bandwidth of the receiver, chirp rate of the transmitted LFM signal can be reduced by adjusting the bandwidth and repetition rate of input IF-LFMCW signal, as demonstrated in Fig. 3. However, this may result in bandwidth reduction and thus degrade the range resolution. To address this problem, a photonic delay line, such as a span of optical fiber, can be inserted before the PM to introduce a known time delay to the reference optical signal. This time delay (denoted as Δτ’) is used to cancel out part of the time delay (Δτ) corresponding to the wireless transmission of the LFM signal, and hence a low-frequency de-chirped signal is achieved with Δf = 4k(Δτ − Δτ’). When calculating the actual target distance, an extra distance of cΔτ’/2 should be added. With this method, real-time processing is still realizable for long range target detection, as long as the transmitted signal power is large enough. Besides, by applying this photonic delay line technique to reduce the de-chirped frequency, the requirement for real-time target detection can be relaxed. The range resolution of a radar is related to the operation bandwidth. Conventional K-band radars usually have a bandwidth of several hundreds of megahertz, and the range resolution is ~15 cm21,22. A terahertz radar can achieve a range resolution of ~1.5 cm23, but the performance is limited by the complex electric circuits and the short detection range. Photonics-based radar has the potential for a very broad operation bandwidth, which, however, has not been fully developed in previous demonstrations. For example, the photonics-based radar in11 has a maximum bandwidth of 200 MHz, corresponding to a range resolution of 7.5 m. In our experimental demonstration, the 8-GHz bandwidth is restricted by the bandwidth of the antenna pair. As for the proposed photonic signal generation and de-chirp processing, the operation bandwidth is only limited by the electro-optical modulators and photodetectors. Thus the proposed radar has the potential to be operated with a bandwidth of tens or even hundreds of gigahertz, making it possible to achieve an ultra-high-range-resolution below 1 cm. We have proposed and demonstrated a photonics-based real-time high-resolution radar applying optical signal generation and de-chirp processing within a compact configuration. The LFM signal generated by optical frequency quadrupling has a very large bandwidth that is required in a high-resolution radar. Besides, photonic de-chirping of the reflected echoes avoids the use of electrical frequency conversion and high-speed ADCs, making it possible for real time processing of a broadband signal in radar receivers. Performance of the proposed method is investigated through an established radar operating at K-band with an 8-GHz bandwidth. The experimental results confirm the feasibility and good performance of the proposed radar scheme, which is a promising solution for real-time ultra-high-range-resolution target detection." Russian articles from time to time wont shut up about applying this to mig-41, su-57, su-35 including drones and ships. So can someone dumb this source down for me? an quote like, "Performance of the proposed method is investigated through an established radar operating at K-band with an 8-GHz bandwidth." makes me assume that they are getting k-band quality radar resolution in lower frequencies like X-band. “Concern radio-electronic technologies (kret) has created an experimental model radiovolnah radar for the fighter 6th generation, which will replace the pak fa (t-50), reports tass deputy general director of the enterprise Vladimir mikheev. According to mikheev, "Progress in developing avionics for the aircraft of the sixth generation is, and in particular in respect to radio-optical photonic antenna array it on a radar locator". In r & d (research work) on the basis of the experimental sample is constructed and the emitter and the receiver. All of this work, is the location – emitted microwave signal, it is reflected back, we acquired and processed, the resulting radar image of the object. Look at what you need to do to it was optimal, he said in an interview. The deputy director noted that "Now the research is a full-fledged model of this radio-optical photonic antenna array, which will work out the characteristics of a production model". We understand what it (the radar) must be in any geometric size, on what bands and what power should work, he added. Kret also fulfills the technology specific elements of the new radar its emitter, photonic crystal, foster tract resonators. Serial sample locator do when we move to the stage of experimental design work (okr), for example, by order of the war department, said mikheyev. He explained that "Conventional radar station (radar) radiation is generated by vacuum-tube or semiconductor devices, the efficiency is relatively low – 30-40%". The remaining 60-70% of the energy is converted into heat. The new radar a radar signal is obtained by converting photonic crystal laser coherent energy in a microwave radiation.This transmitter efficiency will be not less than 60-70%. That is a big part of laser energy will be converted into a radar, with the result that we can create a radar of high power, said the deputy director. The locator will not be a separate module in the nose of the aircraft, it will be a distributed system. Something similar can be seen today on the fifth generation fighter t-50 radar which operates in different bands and in different directions. In fact it is a single locator, but he exploded on the plane. It turns out about three or four different radars, which are comfortably placed around the fuselage and can simultaneously observe all the space around the aircraft, said mikheyev. Radiophony radar will be able to see, according to our estimates, far beyond the existing radar." They other perk to this kind of radar that I see is that 60-70% minimum transmitter efficiency can be achieved while they describe modern radars having this amount of percentage transmitted to heat. And of course overheating is a problem for every aircraft radar. If anyone can dumb down the explanation of the 1st source let me know since this topic pretty much relates to the subject of this thread. Space/time processing (also known as STAP) is a technique where the signal is analysed both in the frequency domain and in the time domain. fidgetspinner wrote: Russian articles from time to time wont shut up about applying this to mig-41, su-57, su-35 including drones and ships. So can someone dumb this source down for me? an quote like, "Performance of the proposed method is investigated through an established radar operating at K-band with an 8-GHz bandwidth." makes me assume that they are getting k-band quality radar resolution in lower frequencies like X-band. I think it is important for you to first understand their terminology. Range resolution is the ability of a radar to separate two targets that are close together in range and are at approximately the same azimuth. Together with the beam width, you got the resolution cell (which is how you determine the accuracy of a radar), but that the topic for another time. The range resolution capability is determined by pulse width. 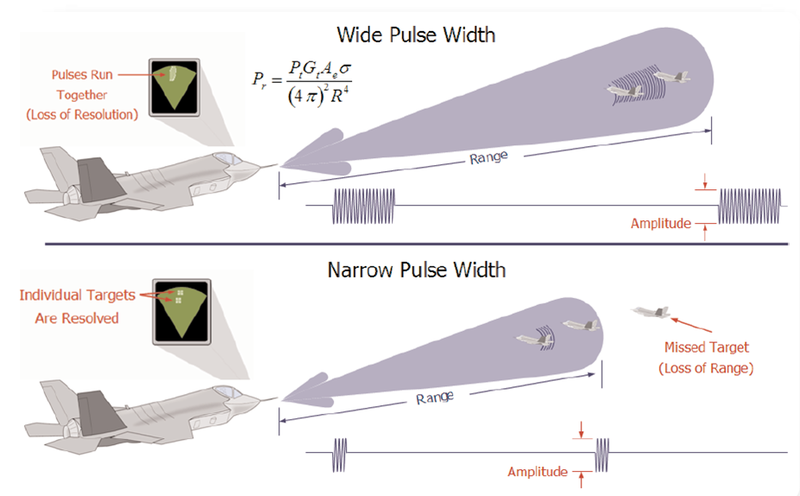 A radar pulse in free space occupies a physical distance equal to the pulse width multiplied by the speed of light, which is about 984 feet per microsecond. If two targets are closer together than one-half of this physical distance, the radar cannot resolve the returns in range, and only one target will be displayed. It is the minimum separation required between two targets in order for the radar to display them separately on the radar scope so smaller value for range resolution is desirable. As explained earlier, the longer the pulse, the worse the resolution would be. 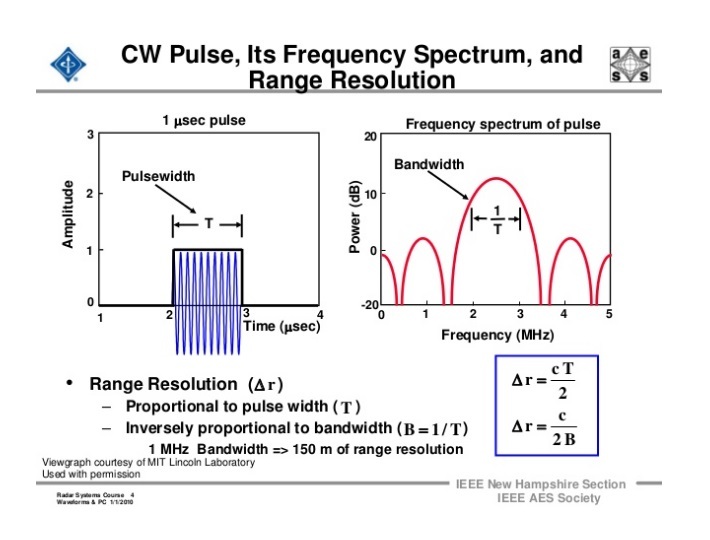 Range resolution is proportional to pulse width and inverse proportional to bandwidth. Shorter pulse will improve range resolution but will also reduce the power of the transmitted radar wave, thus reduce radar detection range. To improve radar detection range and range resolution at the same time, a technique called pulse compression was invented. The basic principles of pulse compression are simple. 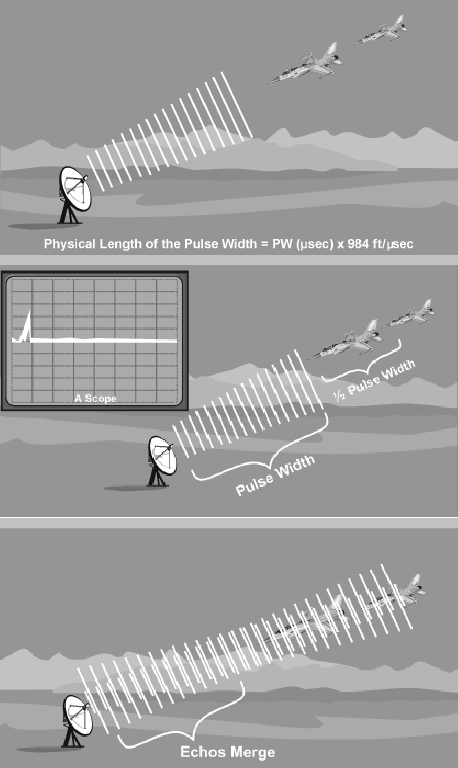 Instead of transmitting a square pulse with the same characteristic from start to finish, radar instead transmits very long pulses that can be divided into several sub-pulses after matched filtering.Thus, radar range resolution would then depend on the length of the sub pulses rather than total pulse length. Pulse compression can be either phase or frequency coded. 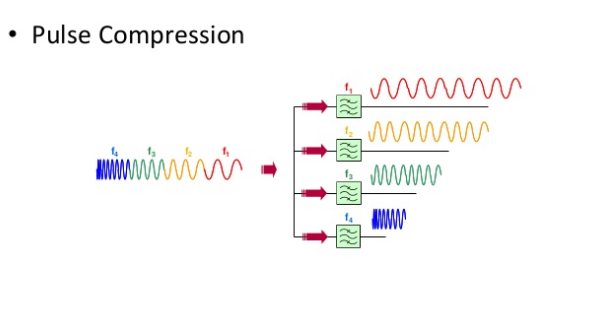 One of the first form of pulse compression is chirp compression (also known as linear frequency modulated pulse) where the frequency of pulse either increase or decrease with time.
. On one hand, in radar transmitters direct generation of linear frequency modulation (LFM) signals by means of direct digital synthesizers (DDS) is limited to a few gigahertz3. Although this bandwidth can be expanded by multiple stages of frequency up-conversion, the signal quality would be inevitably deteriorated which eventually affects the detection performance. On the other hand, the precision of analog-to-digital converters (ADCs) in the receiver drops rapidly as the input bandwidth and sampling rate increase, which severely restricts the resolution as well as the processing speed. Recently, microwave photonic technologies have been proposed as a promising solution for the generation, detection, and processing of high-frequency RF signals taking advantage of the high-frequency and broadband operation capability provided by optical components. In the transmitter, a broadband LFM signal is generated by frequency quadrupling of a low-speed electrical signal applying a single integrated electro-optical modulator. In the receiver, the reflected LFM signal is de-chirped to a low-frequency signal based on photonic frequency mixing. The implementation of photonic de-chirping can directly process high-frequency and large bandwidth signals without any electrical frequency conversion. After photonic de-chirping, ADC with a moderate sampling rate can be used in the receiver and real-time signal processing is realizable. In the proposed system, the bandwidth limitations due to electrical signal generation and processing is eliminated. The method that I would apply would be to build AESA VHF radar. Radar would be scanning mechanically in azimuth using stacked multi beam. When possible target is detected radar would switch to use multi beam mono-pulse method to provide targeting data.